No.2 in my package was this blend. Interesting and different would be my initial descriptor. When I first tried it at about 14 days it was very oaty and meal like and really had a big nut finish. As described on the bag it came across as very clean. Very cocoa like and gave some of the best crema I have ever seen. I tried as a Piccola Latte and the tobacco really came through and the nttiness was pretty sweet to taste. The oat like flavour was still evident and was sweetend by the milk. I asked them about this one and unless they've changed the roast, it's not really intended for espresso. Was advised to try low (14 to 16g) doses and higher temps but I never really nailed it. Made an absolutely cracking FP though, as has all their coffee I've tried. I think Stephen packed you a little of our espresso roast that we sent to the New Zealand roasters (as we didn't have enough WBC espresso left to trade kilo for kilo). We are considering putting it into the shop if there is enough good feedback. The Muchoki is definitely not going to play nice in the espresso machine though! 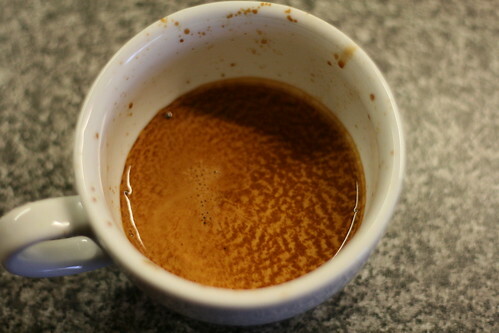 On further reflection it is one of the cleaner espressos I have had. I think the Tobacco combined with the nuttiness makes for a real good balance. I'll be honest and say that the body isn't that 'thick', but that was I think all part of the cup. Definately suited a smaller milk drink to really enhance some of those flavours. I actuallly used some of my non-espresso roasted SMCR San Fran Tec to make espresso based drinks. I know it wasn't intended for this purpose but I was running low on coffee in general. I can see how it could've used a darker roast for espresso, a little bit of greeness in the espresso. In milk though it is lovely.